The ASCO journal has just expended its portfolio with The Journal of Global Oncology (JGO). This journal is an online only, open access journal focused on cancer care, research and care delivery issues unique to countries and settings with limited healthcare resources. David Kerr, MD, DSc, is the founding Editor-in-Chief of the Society’s new Journal of Global Oncology (JGO). Prof. Kerr will set the editorial scope and vision for JGO, an online-only, open-access journal that will focus on cancer care, research, and care delivery issues unique to countries and settings with limited healthcare resources. It is estimated that today nearly two-thirds of all cancer deaths occur in low- and middle-income countries (LMICs), and this is forecast to increase to 70 percent by 2030. While some journals publish special issues and sections focused on global oncology, currently there are no journals solely dedicated to this area of research. 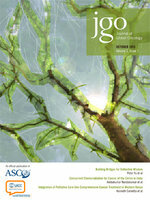 The inaugural issue of JGO will publish later this year and feature high-quality original research, editorials, and other articles that address the unique challenges of cancer care and research in LMICs. Prof. Kerr is a Professor of Cancer Medicine at the University of Oxford, an Honorary Consultant Medical Oncologist at Oxford University Hospitals Trust, and an Adjunct Professor of Medicine at Weill Cornell Medical College. He is a past president of the European Society of Medical Oncology and has served on numerous medical society international committees and working groups. Prof. Kerr co-founded the Africa Oxford Cancer Foundation and has also fostered international collaborations with organizations around the world that share the goal of improving cancer research and care. “There is a growing need for high-quality clinical cancer research in low- and middle-income countries, and I am honored to support the Society’s vision to help improve cancer care and delivery in these areas,” said Prof. Kerr. .The Journal of Global Oncology is funded through the Conquer Cancer Foundation of the American Society of Clinical Oncology with the support of the Conquer Cancer Foundation Mission Endowment, the Doris Duke Charitable Foundation and Novartis Oncology. JGO aims to provide a home for high-quality literature that fulfills a growing need for content describing the array of challenges health care professionals in resource-constrained settings face. Article types include original reports, review articles, commentaries, correspondence/replies, special articles and editorials.